Waterfront Hotel – eating my way through Charm City! Contrary to what the name says, this place is not a hotel – it is a bar. And they make some decent bar food. 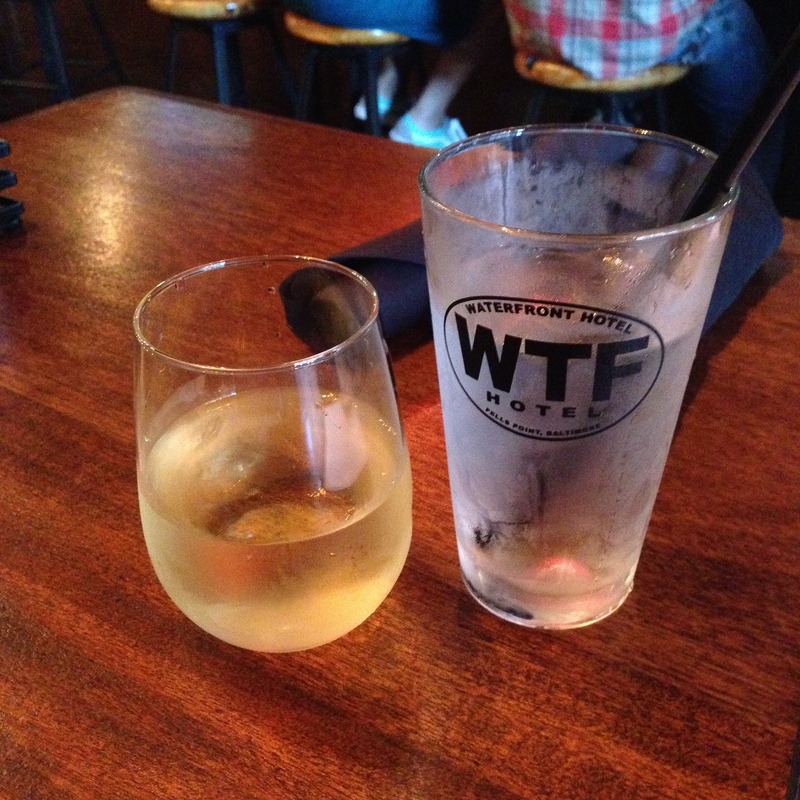 I haven’t decided if the WTF Hotel logo is clever or lame; nevertheless it is everywhere. These guys also do live music overnight starting at 10pm – their website and chalkboard inside lists the bands for the month. I went on a Tuesday for Charm City Trivia (we came in 4th – not to shabby…). They don’t seem to have trivia specials, but they do have a decent number of specials. I chose the Washington Hills Sav Blanc from the two $5 choices. It was fine – much sweeter than I like. I eventually switched to the same winery’s Cabernet Sauvignon. It was taco night – so I went with tacos. I didn’t get the special ($2 per taco) – although it sounded great, it was a little more breakfasty than I was craving – chorizo and potato. I went with the pork belly tacos. Two white corn tortillas wrapped around a large chunk of slow braised pork belly sitting on top of a bed of lime marinated cabbage. They add a little sweetness with a house made mango bbq sauce and top the whole thing with some fried onions. It usually comes with fries, but I have that love hate relationship with fries – so I got the salad instead. Their house dressing is a slightly creamy citrus vinaigrette. It was tangy, but sweet and the salad was a winner – mixed greens with cherry tomatoes, cucumbers and carrots. I love it when a bar can make a decent salad. My friends had the chicken cheesesteak and the burger, both with fries. I think the black and blue burger one that battle. This entry was posted in All Good., Charm City, Dinner, Fells Point. Bookmark the permalink. Almost went there last night. Glad to hear you liked it !